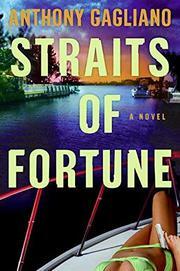 A bruiser takes on a tycoon’s nefarious family in sunny Miami Beach. Jack Vaughn, the charismatic hero of Gagliano’s debut crime novel, is a man of many influences, both visceral and intellectual. As a newly reformed personal trainer for the nouveau riche, he’s a genuine tough guy but one who surprises his more sophisticated clients with cerebral comebacks. Yet with more than 200 pounds of muscle, he still conveys a sense of menace. Jack moves smoothly among his peculiar clients with an adolescent wit, chasing away the creaky skeletons of his past life as a disgraced New York City cop. Unfortunately, his investigatory instincts get the better of him when he’s presented with a sinister offer from Colonel Andy Patterson, an enigmatic Vietnam War hero and newly wealthy biotech capitalist. Patterson’s daughter Vivian, a secretive half-Vietnamese minx who happens to be Jack’s former lover, has murdered local pornographer Randy Matson, ostensibly to hide her starring role in one of his productions. Patterson offers Jack a significant sum to sink a yacht and its deceased occupant in the watery depths off Miami, but the job quickly goes wrong. Soon, the old pro is dodging bullets from a savage soldier of fortune named Williams, dodging the attention of the FBI and Border Patrol and unraveling the Gordian knot tying together Williams, Vivian, her sullen half-brother Nick and the Colonel’s nefarious plot. The plot, an animated amalgamation of pharmaceutical intrigue and familial double crosses, is nothing special. But the author demonstrates a genuine consideration for Miami’s “ongoing battle between the paradise visions of the past and the nightmare prophecies of the future,” in the manner of John D. MacDonald and Carl Hiaasen. Jack’s tenacious swagger and bizarre comrades, including an Arab doctor, a surly gym owner and a high-spirited ganja-smoking rapper named Space Man, make the tale a variation on sunshine noir. A testament to the enduring allure of Floridian oddity.